The working relationship between an investor and a financial advisor is a unique one. However, while every such relationship is different, there are commonalities among these affiliations that can be studied. The results of those studies can lead to conclusions about investors based on their advisor dependency. 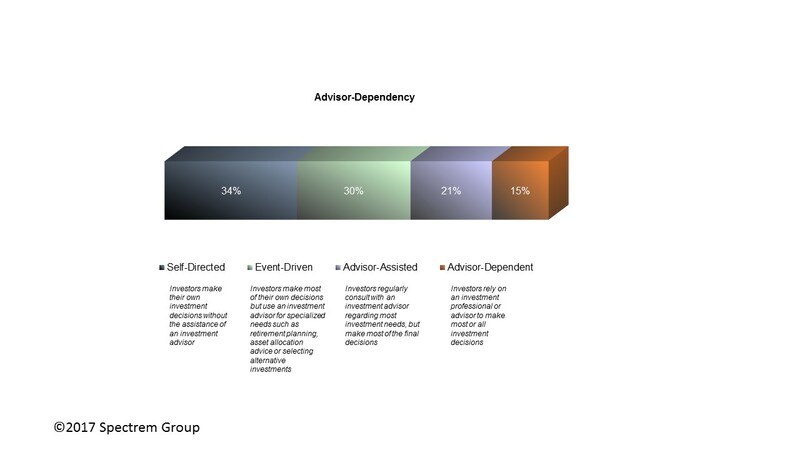 With all of its multi-client research on affluent investors, Spectrem segments the investors based on the depth of the advisor relationship – starting with the Self-Directed investor with little to no advisor involvement to the Advisor-Dependent investor who allows his financial professional to make most and possibly all investment decisions. Advisors learn quickly what kind of investor a new client is going to be in terms of their reliance on the advisor. What they may not know is how the dependency affects portfolios, risk tolerance, attitudes towards investment purpose, and investment strategy. One-third of Millionaire investors with a net worth between $1 million and $5 million consider themselves to be self-directed investors, meaning they operate almost entirely on their own in regards to investing. The percentages drop as advisor dependency increases, and only 15 percent of Millionaires consider themselves to be advisor dependent, which means they allow advisors to make most of their investment decisions. Besides their behavior toward their advisors, these investors have other significant differences in their investment strategies. There is a dramatic difference, for instance, in the percentage of investable assets in the portfolios of investors based on advisor dependency. Spectrem’s study of investor assets, Asset Allocation, Portfolios and Primary Providers, shows that among Millionaire investors with a net worth between $1 million and $5 million, Advisor-Dependent investors have 63 percent of their total assets as investable while Self-Directed investors have only 52 percent in the same category. Advisors working with less dependent investors can contribute information when asked, and make recommendations when it seems fit to do. But advisors working with heavily dependent investors are in a position of great influence. Understanding the tendencies of the Advisor-Dependent investor can direct that influence in a way that could project competency and perhaps invite their Advisor-Dependent clients to offer recommendations to other investors. According to the Spectrem study, Advisor-Assisted and Advisor-Dependent investors are more likely than other investors to consider their investments to be a tool for financial security and income rather than growth as the primary objective. The investors who are less advisor dependent, the Self-Directed and Event Driven investors, are much more likely to consider growth to be the primary objective of their portfolio. Similarly, Advisor-Dependent investors are more likely to describe their investor strategy as Conservative, with an eye toward protecting the money they place in investments first and foremost. These insights point to an investor who takes great care with their investments, which is why they turn their investable assets over to a professional. The question for advisors working with Advisor-Dependent investors is whether the careful, conservative approach reaps the best growth levels. Advisors must walk the fine line between investing in a product with a strong possibility of growth versus defying the demands of their Advisor-Dependent investors who suggest the conservative approach is best. At the same time, advisors can have an effect on the portfolio of investors who rarely call for advice. Self-Directed or Event-Driven investors with an active investment strategy can be wooed by an occasional call from an advisor, and if an investment is made and is successful, that initial contact could blossom into a greater relationship between the investor and the advisor.